Junior Madeline Sanders is entering her third year on staff for The Red Ledger and is pumped to be Editor-in-Chief alongside her partner-in-crime, the lovely Liliana Hager. The two first met in seventh grade journalism, and are more than ready to tackle junior year and TRL together. 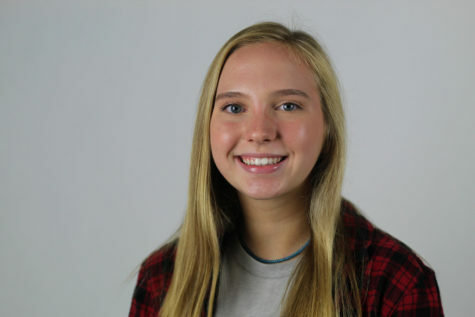 Outside of the newsroom, Madeline enjoys spending her time making art (even though she isn’t very good), hanging out with friends, listening to music (every kind under the sun), running, reading her Bible, going to YoungLife, watching old vine compilations, and driving her thunderbird. She also enjoys the finer things in life including throwback One Direction, the chocolate fudge iced brownies from the Walmart bakery, Honeycomb cereal, college football (gig them), but most importantly, dogs. However, she does not enjoy wasps, olives, the word ‘crust,’ disorganization, and fake nails. Madeline tries to live like she is at camp 24/7, which mainly is her excuse to wear a t-shirt, Chacos, and Patagonia shorts as much as possible. Fueled by kombucha, chocolate brownie clif bars, and the musical stylings of Fleetwood Mac and Ben Rector, Madeline pushing herself to make this the best yar of TRL yet.